The columns in the table are defined by the static Atoms variable defined on the subclasses. Definition at line 222 of file AccelTable.h. 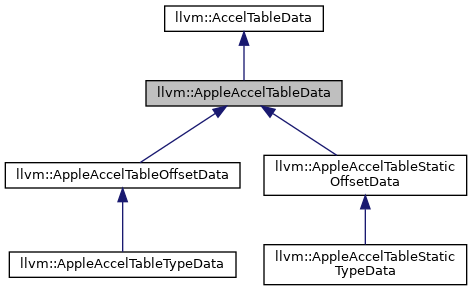 Implemented in llvm::AppleAccelTableStaticTypeData, llvm::AppleAccelTableStaticOffsetData, llvm::AppleAccelTableTypeData, and llvm::AppleAccelTableOffsetData. Definition at line 245 of file AccelTable.h.